Amid claims of 'misusing' the armed forces for electoral gain, Prime Minister Narendra Modi on Tuesday said the strength of 'one vote' had enabled the surgical strike and air strike in Pakistan. 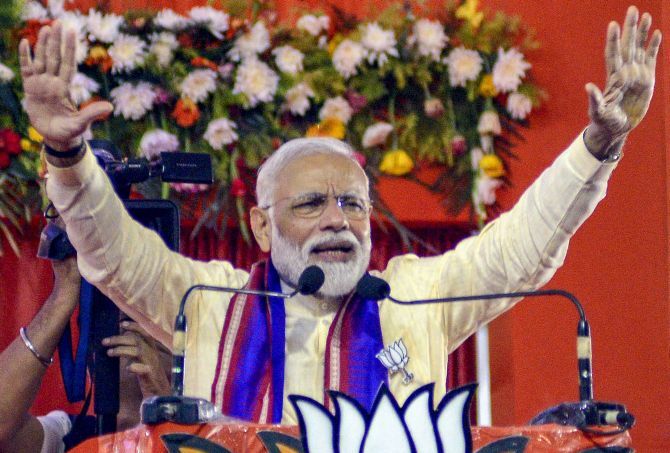 Addressing a poll rally in Bhatapara in Chhattisgarh, Modi said the India of today carries out surgical and air strikes across the border and shoots down satellite in space due to the strength of 'one vote' of the people. Modi also stepped up attack on Congress chief Rahul Gandhi, saying it was the mindset of the 'sultanate' of the 'Naamdar' to abuse the deprived and treat them as slaves. Modi's barb came a day after Gandhi made the 'how come all Modis are thieves' remark. Modi attributed Gandhi's comment to frustration among the Congress and its 'maha milvati' allies caused by the 'BJP wave' being witnessed across the country. "I have a question. Why all the thieves have Modi in their names whether be it Nirav Modi, Lalit Modi and Narendra Modi? We don't know how many more such Modi's will come out," Gandhi had said, addressing a rally in Maharashtra Monday. The Congress labelled honest tax-payers as selfish, Modi said.